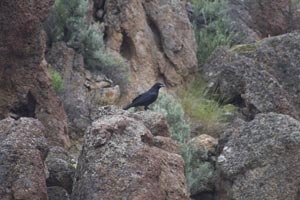 I hike up Pickett Creek canyon to the Narrows, to check on a Raven nest in a little cave in the cliff walls. 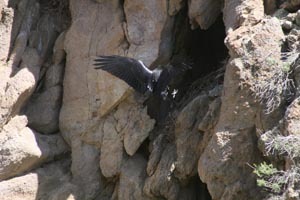 I climb up on the opposite cliffs and look directly across at the nest. It is empty. 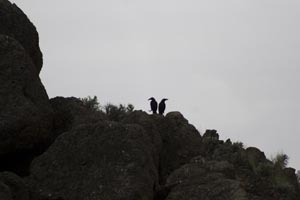 The young have fledged, and ten yards to the side and a little higher, two young Ravens are hopping about on miniature boulders, slightly worried about me because Ma and Pa Raven are squawking up a storm, educating their young about humans. The two youngsters, smaller than the parents and with still-partially white beaks, hop back and forth between the rocks, watching me. One Raven disappears. The other youngster walks, and hops, and watches me, undecided what to do, while the warnings of Ma and Pa still echo loudly off the canyon walls. 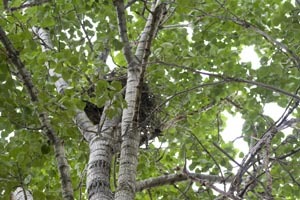 Next I check the Raven nest up Bates Creek. Where there should be noise, there is an eerie silence. The nest is empty, but the young should still be around - somewhere. And they are. Or one is, at least. 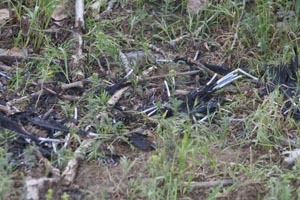 I first see a pile of Raven feathers in the grass below the nest tree. Pin feathers with thick shaft coverings and a raw piece of meat, possibly part of a wing. 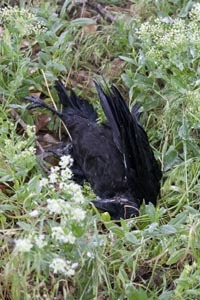 And then my eyes fall on a black lump in the grass - a dead young Raven. No obvious wounds, but laying by the pile of feathers of what was probably his sibling, one foot still grasped around a little tree branch. Did a hawk get one and the other fell out of the tree trying to defend him? He would have been able to fly. Why didn't he fly away? Why was he not touched by a predator? Where were the parents? 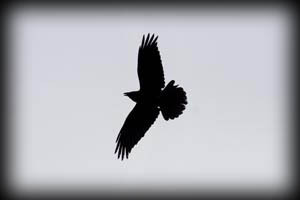 I touched the beautiful little black raven body, soft and shiny, and whispered good journey to him. They could have gotten West Nile. It's really hard on corvids.